1 of 4 In a large bowl, whisk together flour, baking powder and salt. 2 of 4 In a second large bowl, beat butter and sugar until smooth, about 2 minutes. Beat in egg, milk and vanilla. On low speed, beat in flour mixture until just combined. 3 of 4 Gather dough; divide in half. Form each half into a disk. Wrap tightly in plastic wrap. Refrigerate 4 hours or as long as overnight. 4 of 4 Heat oven to 350 degree F. Roll out one dough disk to a 10-1/2-inch square (about 1/8-inch thickness). Trim slightly and then divide into 16 cookies. Place on ungreased baking sheets; bake at 350 degree F for 12 minutes until light golden around edges. Repeat with second half of dough, rerolling scraps, if desired. Remove cookies from baking sheets; cool on rack. 1 of 1 In large bowl, combine confectioners' sugar, powdered egg whites and water. Beat on high power with an electric mixture until good spreading consistency. transfer 1/3 to a small bowl. Tint black. Tint a second 1/3 of the frosting green. Leave the remaining 1/3 white. 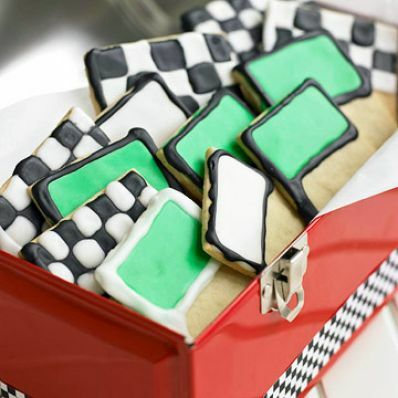 Frost some of the cookies solid white, some solid green and some in a checkered pattern (put white in one bag, black in another and alternate squares). Dry cookies on rack.